This entry was posted on June 12, 2011 by Megan @ When Harry Met Salad. It was filed under fruits & vegetables, salads & dressings and was tagged with asparagus, feta, mint, radish, salad, spring. Okay, I am sold. This looks like something I would like VERY much. It never would have occurred to me to combine all these things, but wow – it sounds (and looks) fantastic. We are getting our very first CSA produce box of the season this week, and I’m hoping it will contain some radishes and asparagus! If not I’ll have to go pick some up because this is definitely on my list. Thanks for sharing! I love the promise of a CSA box! For the past two summers I was part of a CSA program (with my oft-mentioned favorite farmer) where I worked on the farm in exchange for my share. It was so rewarding, and I loved being that connected to the food I was eating. Sadly, I’m not doing it this summer because I’m just too busy, but I still buy most of my produce from the farm. Same vegetables, but a lot less weeding. I was hoping you’d make something yummy with those radishes! We have two bunches from our CSA and I wasn’t sure what I wanted to do with them. I honestly don’t think I’ve ever eaten a radish. Thanks for this great recipe, and all of your beautiful photographs that make it look almost too good to eat… almost! I hadn’t eaten radishes until a few years ago, actually. 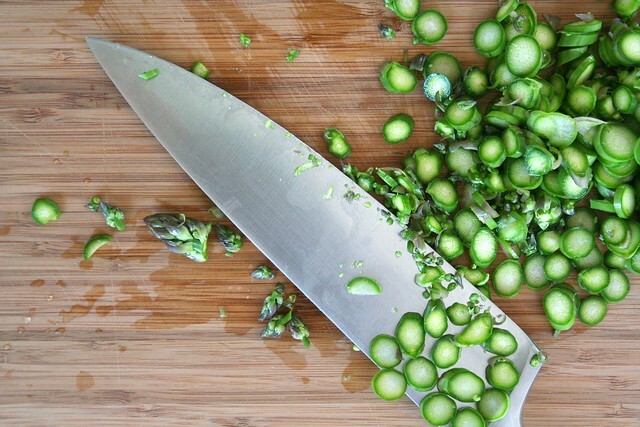 My favorite thing to do with them is to chop them up into tiny bits ( a food processor is great for this) and mix them with softenend butter and coarse salt to make a spread. 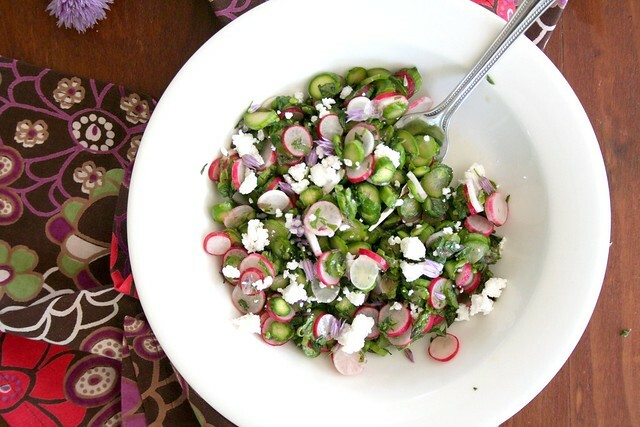 You can even chop up some of the radish greens and mix them in as well. It’s awesome just spread on crackers, and I make it for pretty much every party that I’m invited to. 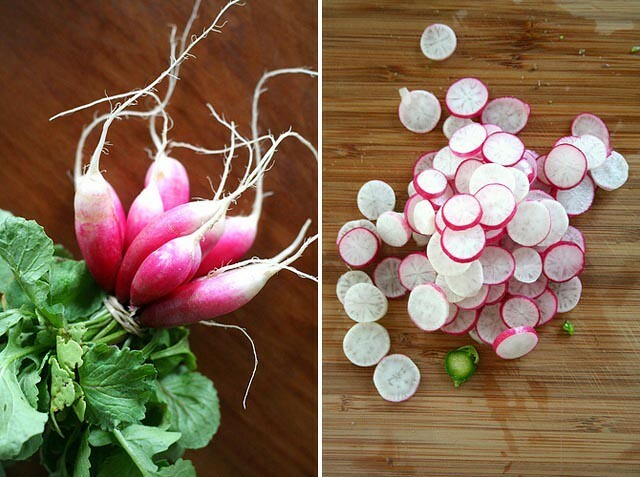 We just planted another batch of radishes, and this looks like a perfect recipe to use them for! I just starting roasting radishes (only for about 10-15 mns in the oven) before tossing them in salads or using them to dip in hummus. They are great! This sounds AMAZING. I can’t wait to try it! Awesome photos, as always. 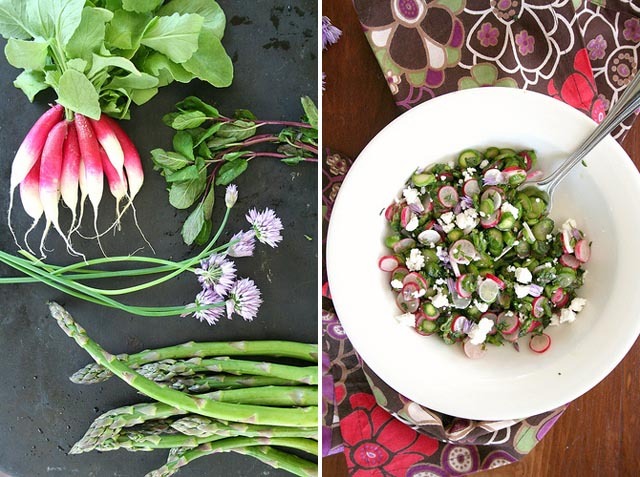 We’ve gotten lots of green and radishes in our first two farm shares so thanks for all these ideas. I have so many radish in my yard, this is one to try! I love this recipe!! I can’t wait to try it :) I am so glad I found your blog – about a year ago, my mom discovered you by searching for lavender cookies (we were thinking about making some for my upcoming wedding). Well, in the chaos that is wedding planning, your lovely blog was lost to us. I have been trying to find you ever since then, and am so glad that I finally did! And it’s a small world, because here you are on wordpress.com :) stop by my little blog sometime and say hi – I’m looking forward to your recipes!